BEIJING (Reuters) - In the race to develop self-driving cars, the United States and Europe lead in technology, but China is coming up fast in the outside lane with a regulatory structure that could put it ahead in the popular adoption of autonomous cars on its highways and city streets. Without coordination, that patchwork could hold back the development of self driving cars in the U.S., David Strickland, a former safety chief for the National Highway Traffic Safety Administration, said at an event in Beijing this month. China's top-down approach could see it overtake the U.S. and Europe, where automakers have generally been left to agree among themselves on industry standards. A push for self-driving and electric cars also fits with Beijing's shift to an economy driven by high-tech and consumer industries rather than heavy industry and low-end manufacturing. As relative newcomers to mass car ownership Chinese also tend not to share the West's love affair with driving. In a 2015 World Economic Forum survey, 75 percent of Chinese said they would likely ride in a self-driving car, versus half of Americans. Within 20 years, China will be the largest market for autonomous features, accounting for at least a quarter of global demand, says Boston Consulting Group. The China draft would be opened up for industry comment and input from a range of ministries, ultimately going to the State Council, or cabinet, for approval. At a most basic level, the committee will define a 'self-driving' car and set a minimum level of functionality, said Bai Jie, a professor at Tongji University who also sits on the expert committee. In other respects, China plans to be more ambitious. It may adopt cellular data technology - already used in many cars to access the Internet - for cars to communicate, rather than the dedicated short-range communications (DSRC) standard used in the U.S. and Europe, said Li, the panel chairman. "The U.S., Europe and Japan spent so much time developing DSRC, so they strongly recommend it for China," Li said. "Here, we're just beginning so why not choose advanced technology like LTE (Long Term Evolution wireless broadband technology) or 5G?" China's provisional timeline would put it at least in line with, if not ahead, of others developing self-driving cars. By 2020, Toyota Motor aims to market a car that can drive by itself on highways, and Mercedes, after two decades of research, plans to launch a self-driving car, though drivers would be required to take control in certain situations. Chinese automakers including SAIC Motor and Ford Motor's local partner Changan have internal targets that match the likely draft roadmap, and are represented on the experts committee, Li said, while foreign car makers are not. To be sure, China has some way to go to become a global pacesetter in autonomous driving. Li, the committee chief, said the panel was only now looking into legal issues around self-driving cars, such as who is liable in any collision. Li Shufu, chairman of automaker Geely [GEELY.UL], has said China must revise its laws so the manufacturer, not the driver, is held responsible for accidents when a car is in self-drive mode. "If (our) legislation lags behind, self-driving cars will be difficult to sell in China," he said. "It's certainly possible for the Chinese auto industry to make significant headway with government backing, but there's still a lot going into developing that technology, making sure it's safe, and that means a certain number of miles driven," said Jeremy Carlson, an analyst at consultancy IHS Automotive. 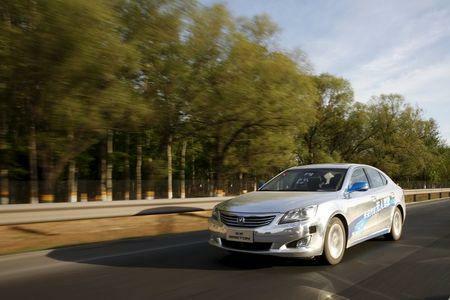 Ahead of next week's Beijing autoshow, Changan took a couple of its prototype self-driving sedans for a 2,000 km (1,243 mile) trip from its Chongqing headquarters to the Chinese capital. With a test engineer behind the wheel, but with his hands in his lap, the automated system guided the car along the highway at 80 km per hour, adjusting speed for traffic and speed-limit signs, while keeping centered in its lane - roughly on par with the self-drive capabilities of Tesla models already on the market. Changan's Li said a self-driving model should be on the market in 2-3 years, with the automaker spending 5 billion yuan ($773 million) to further the technology by 2020. It is also in talks with Internet giant Baidu on developing automated driving technology. 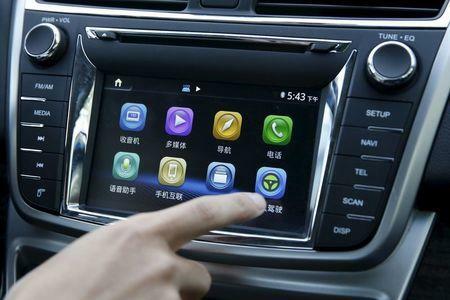 "The intersection between technology companies and automakers is the space to watch," said Wang Yanmin, a professor at Beijing Normal University.